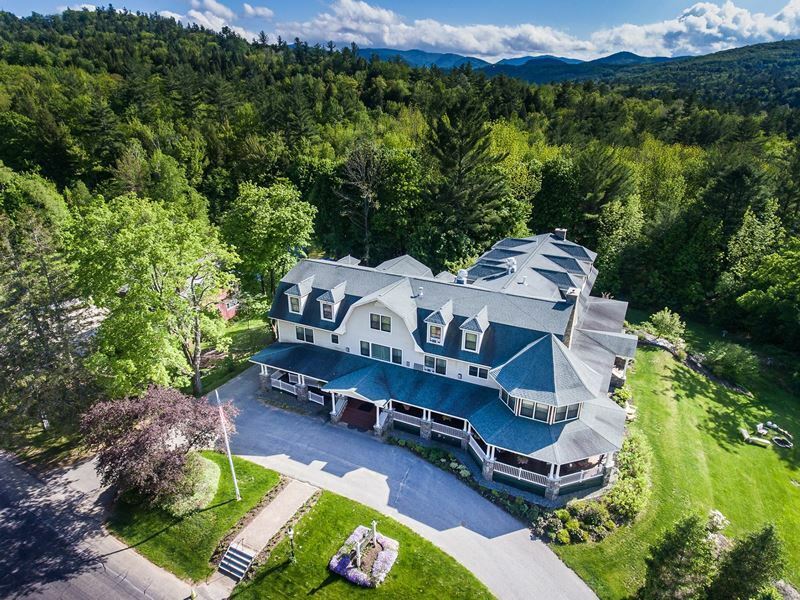 Best known for its colossal network of hiking trails and blissfully calm lakes during the summer and adrenaline-pumping snowboarding and fast-paced dog sledding during the winter, the White Mountains in New Hampshire is a first-rate holiday destination all-year-round. Whether you visit when the sun is shining or the snow is falling, there’s a good chance you’ll be spending enough time outdoors to work up a healthy appetite. And when the hunger pangs come, you don’t want to be let down. Holidays are too short for bad food. So to help you out, here’s our guide to the top 10 restaurants in the White Mountains, New Hampshire. 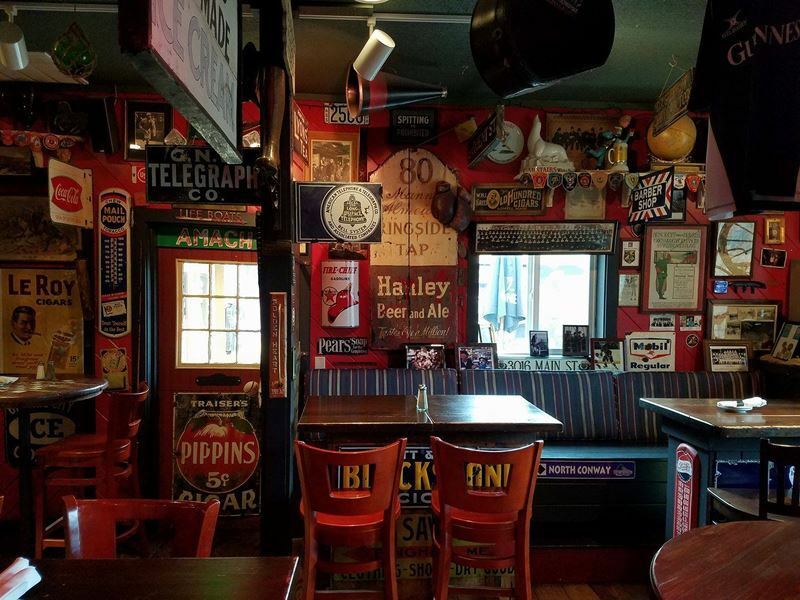 The scene: A casual, inviting tavern with a cosy ski lodge theme, Delaney’s Hole in the Wall is decorated with vintage photos of local skiing areas taken generations ago, real working fireplaces and random pieces of skiing memorabilia, giving it a welcoming, no-frills feeling. The comfort food New England cuisine is based on homemade family recipes, with locally sourced ingredients and organic produce playing a huge role. The main menu features a variety of nibbles, salads, soups, pizzas, burgers and meat and fish dishes, including popular favourites such as 12oz New York sirloin, lobster mac ‘n’ cheese, ceasar salad and surf ‘n’ turf burgers accompanied by hearty sides like homemade onion rings. There’s also an extensive sushi menu, featuring everything from raw and cooked maki to full sushi and sashimi platters. What really makes a trip to Delaney’s Hole in the Wall special is their range of delicious home-brewed beverages, including taste bud-tickling root beer, cream soda and sparkling water. Signature dish: Baby back ribs slow cooked and smothered in Delaney’s legendary maple-jalapeño barbecue sauce with a choice of potatoes or rice and fresh vegetables. The scene: Not your typical fast food diner, Black Mountain Burger Company is the place to go for the best burgers in New Hampshire. 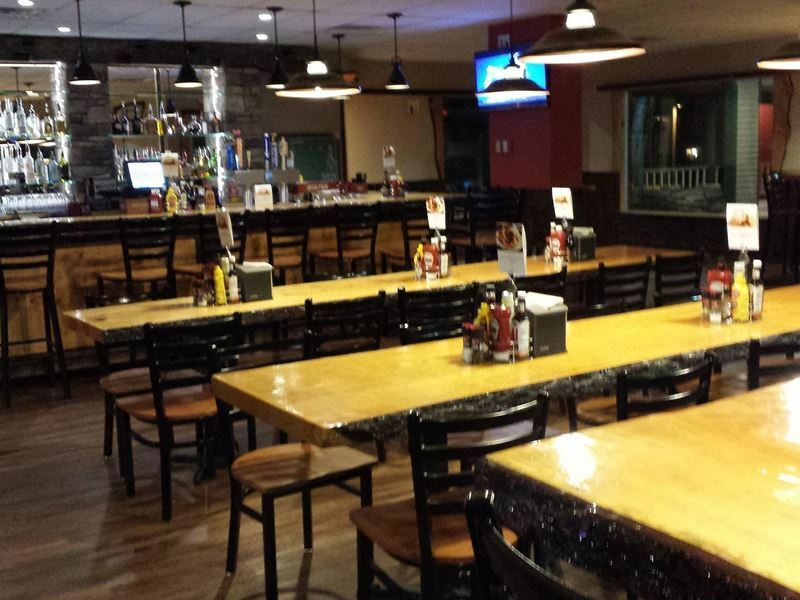 The cabin-style wooden décor, raised bar seating and sports momento decorations give this place a laid-back vibe, solidified by the friendly, casual service. The highlight of the American comfort food menu are the burgers, made entirely from scratch using 100% angus beef (with the exception of the Southwest veggie burger, of course). 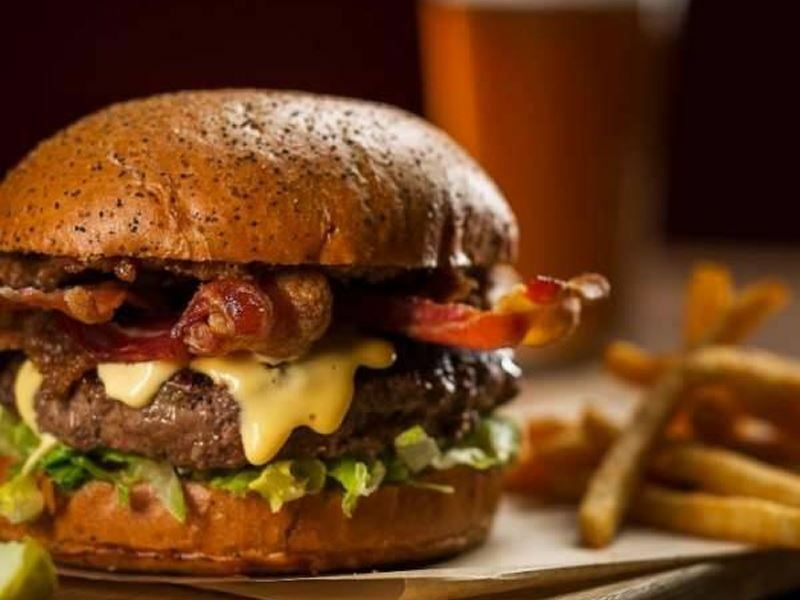 If you’re not satisfied with the 13 drool-worthy burger options available, you can customise your order with all kinds of amazing extras, ranging from beef and bean chilli or guacamole to hickory-smoked bacon or house-made maple mayonnaise. There’s even a burger temperature guide on the menu so you can order your burger exactly how you like it. For anyone not in the mood for a burger, there are plenty of other US classics available, too, including crisp wedge salads, creamy chowders, mac ‘n’ cheese balls and Canadian poutine. Signature dish: The classic burger. 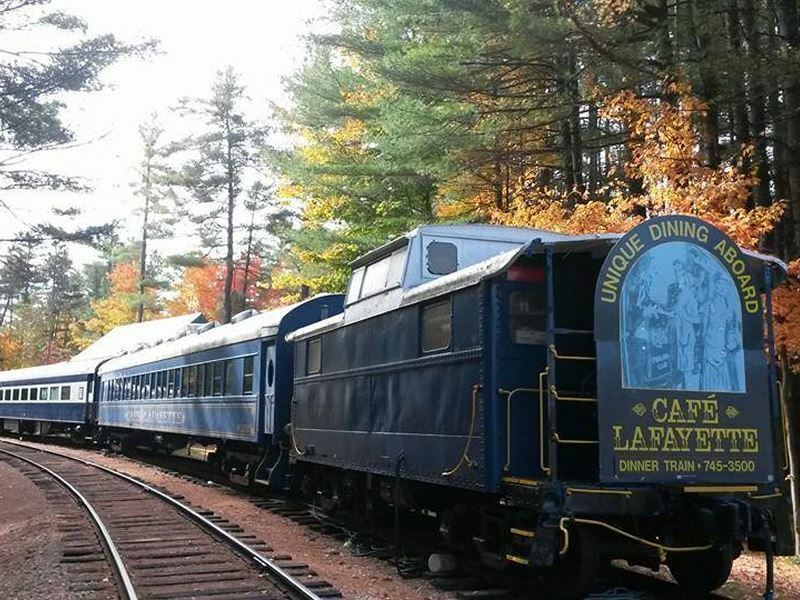 The scene: Tucked away into the western slopes of the White Mountains, Café Lafayette Dinner Train is one of the most beautiful, unique and enchanting restaurants in the area. Step into the carefully restored railcars and your two-hour 20-mile culinary journey begins, as the dinner train winds its way around the roads, past flowing rivers, thick forests and alluring valleys. The five-course set meal is based on traditional American cuisine and showcases quality seasonal ingredients, freshly prepared on board and cooked to order. The menu changes seasonally, but you can expect your taste buds to be treated to delights such as vegetable pot stickers with peanut sauce, roasted duck breast with black cherry demi-glace, and fillet of salmon topped with puff pastry. To compliment the savoury courses, there’s an irresistible array of daily-made desserts, in addition to a huge choice of wines and classic cocktails. Signature dish: Because the menu is seasonal and changes every few months, there’s no signature dish. The scene: With pressed linen tablecloths, red walls lined with impressive wine racks and excellent service worthy of a top-end restaurant, the Dining Room provides the ideal surroundings for a romantic dinner for two. Their seasonal menu highlights the best of traditional American cuisine, where you’ll find everything from clam chowder with oyster crackers and spinach salad with dried cranberries to lobster ravioli with mascarpone and marinated hanger steak with a mushroom demi-glace. 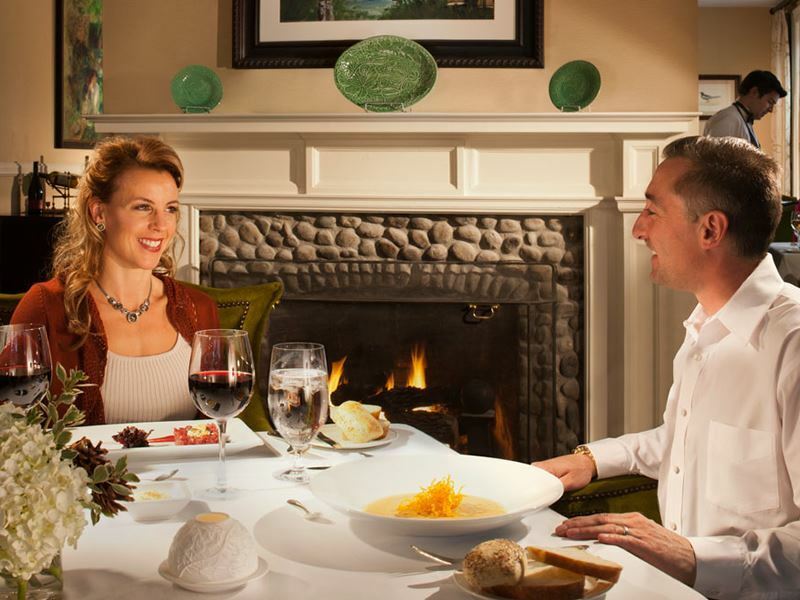 During the winter, the quaint Dining Room takes on an even more romantic ambiance, thanks to the wood-burning fireplace. While in the summer, the patio allows diners to sip light prosecco and soak up the gorgeous views of the Presidential Mountain Range. For a more casual experience, the neighbouring denim-friendly lounge serves the same menu as the main Dining Room, as well as its own selection of lighter fare. Signature dish: Gulf of Maine-raised salmon – pistachio-crusted grilled salmon served on a blend of basmati rice and lentils with a beetroot and horseradish puree. The scene: Set inside a fully restored three-storey Georgian home originally built by a father in 1927 to give to his daughter as a wedding present, the Adair Country Inn Restaurant has a real sense of family history about it. The daughter’s hats, books and photos adorn all corners of the luxurious restaurant, suggesting that you’re dining in the family home. While the crackling fireplace, bare stone walls and dark wooden furniture are almost reminiscent of a masonic lodge. Here the menu is proudly New England, with a focus on simple, flavourful ingredients, including locally-grown vegetables, market-fresh seafood and free-range poultry, which are carefully and artfully presented on the plate. Savour tempting dishes such as buttery wild mushroom strudel, minty lamb lollypops and tender chicken piccata in the romantic dining room or head onto the patio for an al fresco dining experience if the weather allows it. 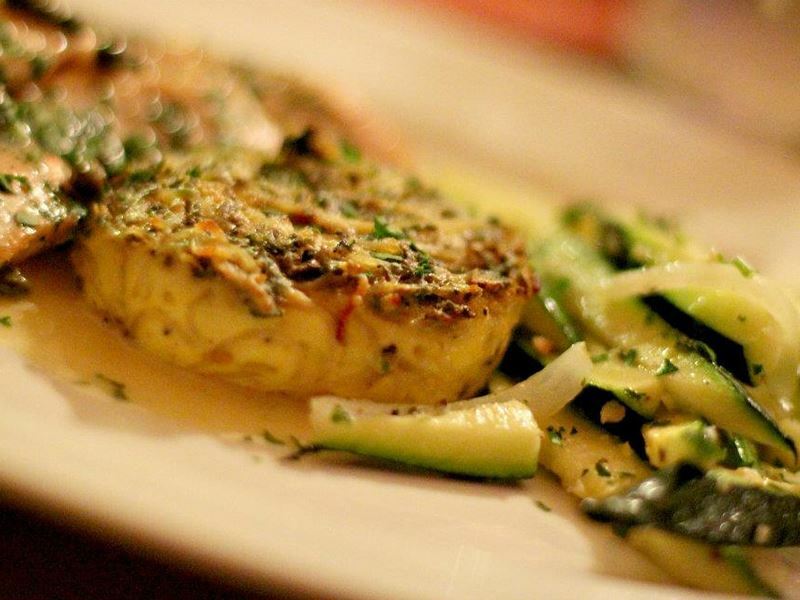 Signature dish: Catch of the day – fresh, seasonal fish prepared with locally-sourced ingredients. 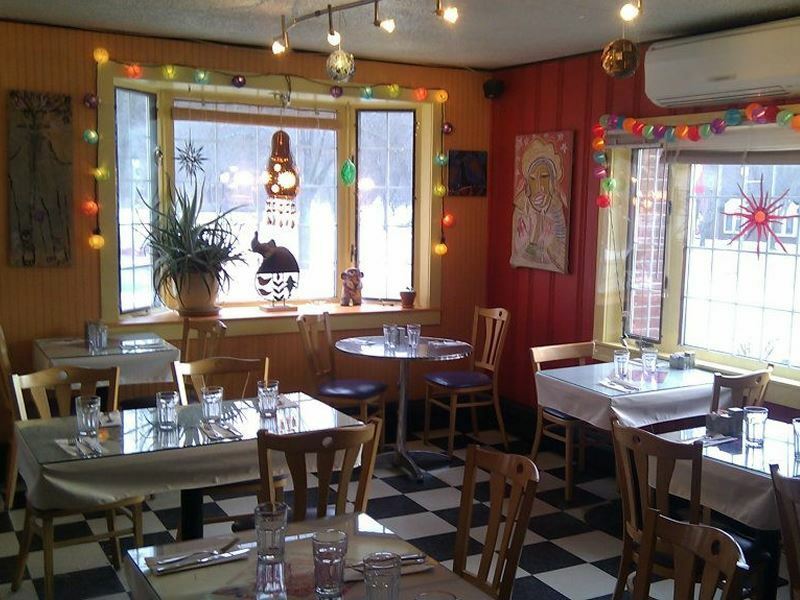 The scene: The Gypsy Café offers an around-the-world dining adventure in the heart of New Hampshire. Co-owned by award-winning chef Dan Duris, this quirky eatery boasts brightly painted walls decorated with local colourful artwork, ethic-style knick-knacks everywhere you turn and a buzzing atmosphere you don’t normally get unless you’ve travelled half way around the world. The food is equally as enticing as the venue, with unique dishes based on international classics, but tweaked to add some New England charm. In addition to the daily specials, the Gypsy Café offers a world of delicious eats, from Peruvian orange peanut stir fry and Caribbean pork to Tunisian lamb and Moroccan shrimp. The international theme doesn’t stop at the food, with everything from oversized frozen margaritas and cool limoncello martinis to homemade red sangria and fiery tequila cocktails just waiting to knock you off your feet. Signature dish: Gypsy-Q chicken sandwich – grilled chicken breast served with crisp lettuce, juicy tomatoes, red onions and smoky Mongolian barbecue sauce in between two slices of soft bread. 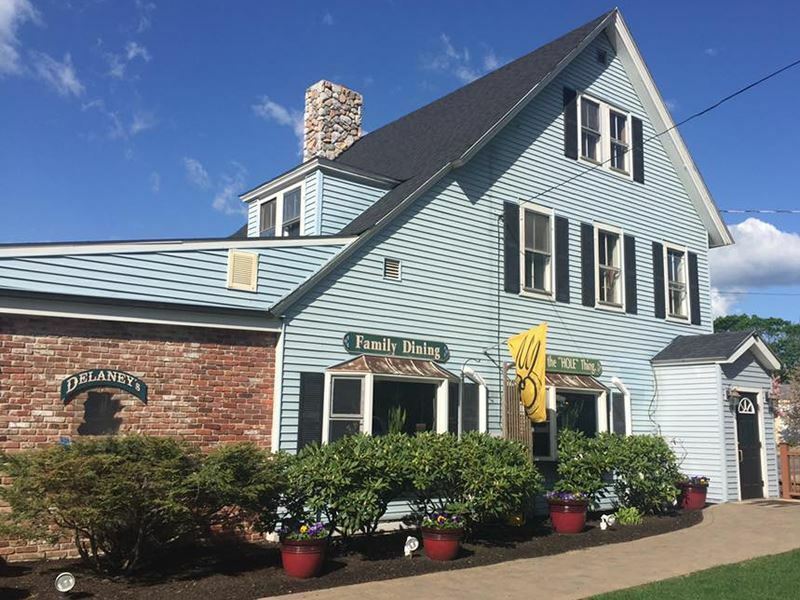 The scene: Offering generous servings of country cooking with Irish passion, May Kelly’s Cottage Restaurant and Pub transports you back to a simpler, happier time as soon as you step through the door. Every inch of space is covered in personal trinkets, Irish collectables and bar memorabilia that add an instant warm charm, while handmade cushions, furniture and artwork prove how much love and care the owners put into the place. The menu features a mix of classic American comfort food, like burgers, sandwiches and ribs, alongside more traditional Irish offerings, such as Gaelic chicken, shepherd’s pie and liver and onions. For an extra authentic experience, the old world restaurant hosts weekly “seisiuns”, during which traditional Irish musicians travel from all over the world to play classic hits together each Sunday. Signature dish: May’s meatloaf dinner – an individual meatloaf wrapped in crispy bacon and served with mushroom gravy, mashed potato and vegetables. The scene: An award-winning restaurant that uses fresh, seasonal ingredients to form their creative, contemporary menu, the White Mountain Cider Company is a rustically elegant restaurant set inside a 19th century farmhouse that’s still home to the original cider mill. The pastoral theme carries on to the inside of the restaurant in the form of a misshapen wooden bar, tall vaulted ceiling and cute twinkling fairy lights, giving it a wonderful homely atmosphere. To make the most of exceptional seasonal produce, the New American menu is changed often, but popular favourites, such as pan-roasted duck breast, seared scallops and grilled pork chop almost always grace the menu. Although the savoury fare is nothing short of superb, the desserts, such as strawberry rhubarb crisp served with mascarpone ice cream and chocolate cheesecake terrine with vanilla bean sauce, always wow diners. For an extra special experience, visit between mid-September and early December for the opportunity to sip the incredible fresh-pressed cider. 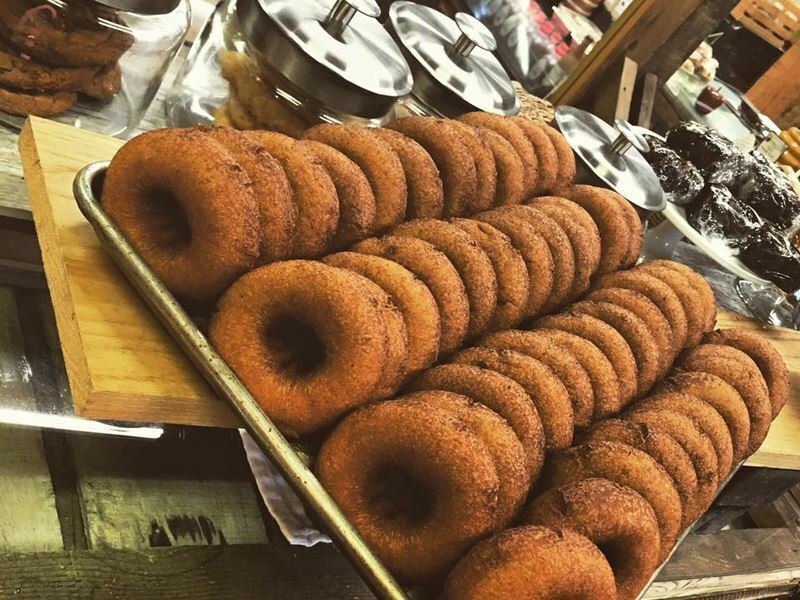 Signature dish: Warm, homemade apple cider donuts served with vanilla ice cream and a drizzle of caramel sauce. The scene: A restaurant so charmingly small you’ll feel like you’re having dinner in someone’s living room, Ariana’s Restaurant is farmhouse dining at its best. This quaint eatery offers just seven tables and one bar, making it the perfect setting for a romantic date night. And thanks to the limited dining numbers, you’ll never struggle to get a view of the open kitchen where chef-owner Martin Murphy works his culinary magic. The New American menu aims to cater for all palates, but there’s a distinct push toward fresh, locally-sourced seafood. Small and large plates of mussels with lemongrass and coconut, vegan tamales, shrimp scampi and steamed pork dumplings all feature on the menu, but if you’re in the mood for something else, you’re encouraged to ask. There’s also the superb and very reasonably priced multi-course tasting menu with wine, made up of five or six courses paired with small pours and creatively made using the ingredients on hand. Signature dish: Pan-roasted scallops served over mushroom risotto with rocket, gorgonzola and a drizzle of truffle vinaigrette. 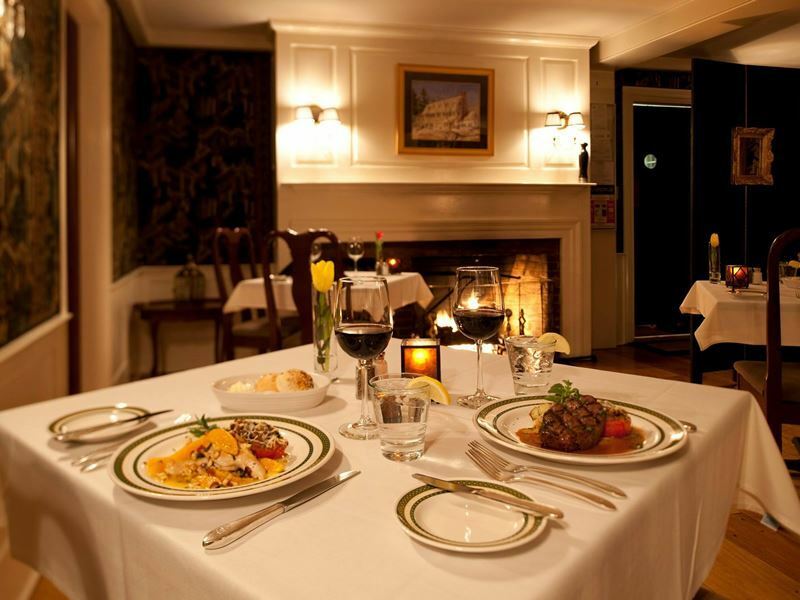 The scene: Highly acclaimed for being one of the very best restaurants in the White Mountains, Bretton Arms Dining Room prides itself on using exclusively the freshest and finest locally-sourced ingredients in its creative dishes. The New American menu combines traditional flavours with cutting-edge kitchen techniques to create gastronomic masterpieces such as Georges Bank sea scallops with pork belly and Enoki mushrooms, butter-poached Maine lobster with cognac syrup and herb-roasted rack of lamb with a black fig demi-glace. To complement the food, there’s a carefully-selected award-winning wine list, with over 40 selections available by the glass. The pressed tablecloths, armchair-inspired seating and well-chosen artwork all give the restaurant a formal, top-end ambiance. But despite its Michelin star-feel, children are welcomed with open arms and are given their own ‘Young Guest’ dinner menu with smaller portions of the main offerings with simpler accompaniments. Signature dish: Crispy braised pork/veal cheeks served with sweet potato, red cabbage, Swiss chard and a jus reduction.